Your Emerald Princess cruise is sure to amaze! 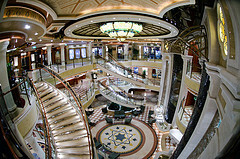 If you have sailed with the Crown Princess, you can expect to find a similar layout on the Emerald. Choosing any Emerald Princess itinerary to the Caribbean will leave you wanting more. 1. "This was our 20th cruise and our 8th with Princess, and we couldn't have been any happier." 2. "Cannot say enough of the fabulous service and the food was excellent." 3. "Nice ship, great itinerary, good food..."
4. "This was a very relaxing and pleasurable vacation and a great way to get away from the cold weather. We look forward to cruising on the Emerald again." 5. "This was by far, our best cruise yet. The staff and crew were wonderful, the food was good..."
1. "The food has been going downhill. On this cruise almost everything we had in the dining room was flat out inedible..."
2. "Princess just doesn't meet our needs the way Carnival does. We find the selection of food items in Princess' Horizon Court to be very limited..."
3. "What was supposed to be a wonderful holiday cruise with family was a bust!" You will be awed when you first get on board. The ship has a beautiful meeting place - an Italian piazza - where you can relax, grab something from the International Cafe, or just watch your fellow passengers. If you are into dipping and splashing, you will have several pools and hot-tubs from which to choose. There is also an adult-only - "The Sanctuary" - where your kids cannot enter. Yeah! You will also be impressed with the Emerald's fine dining. There are formal dining rooms, specialty restaurants and the customary buffet area. Emerald Princess' chefs are said to make finger-licking entrees! There is just too much fun stuff to do on an Emerald Princess cruise! Spectacular View from the "Emerald"
The "Emerald" offers cruise packages to the eastern and southern Caribbean for a half of the year - fall through winter. The Emerald Princess sails out of Ft. Lauderdale to the eastern and southern Caribbean. 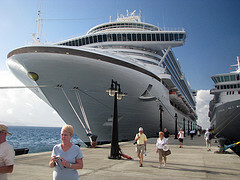 The ports of call included in an Emerald Princess' itinerary are among the hottest spots in the Caribbean. Expect to visit places like St. Thomas and Barbados on an eastern Caribbean cruise; and Aruba and Bonaire on a southern Caribbean cruise. Your Emerald Princess cruise will also make a call at Princess Cruises' private Bahamian resort at Princess Cays. One bit of misfortune to note is that you will not find year-round Caribbean sailings. 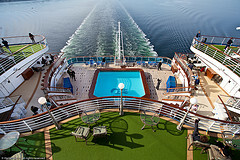 The Emerald Princess offers Caribbean itineraries mostly fall through winter and early spring. It then goes off on transatlantic and Scandanavian/Russian sailings. Check with your Travel Agent for available Caribbean itineraries. There is a 10 Night Eastern Caribbean cruise to: Antigua, St. Lucia, Barbados, St. Kitts, St. Thomas, and Princess Cays, Bahamas. 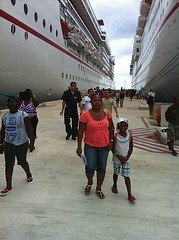 There is a 10 Night Southern Caribbean Cruise to: Aruba, Bonaire, Grenada, Dominica, St. Thomas and Princess Cays. There is a 20 Night Caribbean Cruise to: Antigua, St. Lucia, Barbados, St. Kitts, St. Thomas, Grand Turk - back to Ft. Lauderdale - then to Aruba, Bonaire, Grenada, Dominica, St. Thomas and Princess Cays, Bahamas. As noted before, you will not find an Emerald Princess cruise to the Caribbean year-round. However, if you can travel during the fall, winter or early spring months, I urge you to check out the "Emerald."